Namakkal is a punya stala famous for the Anjaneya Swami temple and Lakshmi Narasimha. It is also known as Dakshina Srisailam. It is is also one of the few thrimurthi kshetra where you find Brahma, Vishnu and Maheshwara in a single shrine. These 2 temples are located in the heart of the town. Namakkal is a city in the Namakkal district in central Tamil Nadu, with a population of about 53000, according to the last census. The city gets its name from “Namagiri”, a rock that sits in the centre of the town. There are two temples in the town – the famous Namakkal Anjaneyar temple and, across the street, the Namagiri Thaayaar and Narasimha Swami temple. The Narasimha Swami shrine is a cave temple that has been dug into a side of the Namagiri. On the other side of the hill is a Ranganadhar Swami shrine. The Anjaneyar temple stands across the street from the Narasimhar shrine, as the Lord Hanuman is having darshan of Sri Vishnu in the Narasimha avatar. We offer our prayers to Lord. We stand in front of the deity and pray, but we should have absolute faith in Him. Only then our prayers are answered. To develop faith in Him, we try. Mere trying will not do, but doing will do the miracle. Have absolute faith in Him and surrender yourself to Him, Saranakatha is what the life of Bhaktha Prahalad imparts to us. Prahalad - the son of Hiranyakasyap - had absolute faith in God; there was not even an iota of doubt in his mind that the Parabrahma exists and exists everywhere. He believed that the very existence of the universe is an act of the God - whereas his father believed otherwise. When challenged by Hiranyakasyap to prove the existence of Parabrahma, Prahlad said that the God exists in every atom and even in subatomic particles. On hearing this Hiranyakasyap retorts and asks Prahlad as to whether the God is in the pillar nearby. Prahlad replies that the God is not only in the pillar but also in the very words uttered by Hiranyakasyap and also in the sound of those words. [Look at the absolute faith the Bhakta Prahalad had on Him.] Angered by this and with a view to proving Prahlad wrong Hiranyakasyap hits the pillar with his mace so as to break it. Lord Vishnu takes the form of Narasimha ie. Half in the form of Nara [man] and half in the form of Simha [Lion] and comes out of the pillar and kills Hiranyakasyap - the Rakshasa. When Hiranyakasyap had tried to kill Prahalad by rolling him from mountain, when brought under the feet of the elephant etc., the God had protected him. But why then the Narasimha avtar of Vishnu in ugra [angered] form? Was it taken to avenge the sufferings of true and faithful at the hands of Hiranyakasyap [representing the evil forces]? Yes, but there is more to it. He took the roopa of Narasimha to prove that the absolute faith should not be failed. While He had taken the rest of the Dasa avatharas after due consideration and deliberation, the Narasimha avtar is considered to have been taken on the kshana (micro second), and even before His consort Sri Devi came to know of it. When Bhaktha Prahalad had seen Lord Narasimha in the ugra he starts praying to Him to mellow down. The prayers of His Bhaktha mellows down the lord. 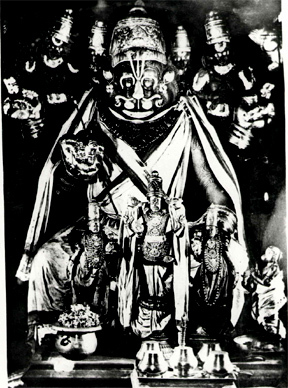 In the mean time, the devathas had to seek the help of Sri Devi to make Narasimha a santha swaroopi. Sri Devi descends on earth to see the ugramoorthi and mellow Him down. Alas! Sri Devi could see only a mellowed Narasimha moorthi. She undertakes penance to see Him as Ugra Narasimha moorthi and enters the nearby tank full of lotus. The 'kamalaya tank' is said to be in the place called Namakkal in Tamil Nadu. It is interesting to know how that place got the name 'Namakkal'. There is a story that is often told about how the Namakkal hill came into being. It is believed that Goddess Lakshmi did not get to witness the Narasimha avatar as it happened, and prayed to Lord Vishnu that she be granted to see it. Lord Vishnu tells her to go to the area that is now known as Namakkal, and that she would witness the avatar there. As the Goddess waited by a pond in the area, Lord Hanuman comes there to take a dip before he performs his prayers. He presents to the Goddess Lakshmi, a Saligraamam stone, which He asks Her to hold until He has finished with his rituals – and He strictly instructs her not to put the stone to the ground. As Lakshmi holds the stone, She realizes it starts to grow heavy in her hands until She has no choice but to put it to the ground. As She does so, Lord Hanuman comes back, and they realize the stone has become immovable. 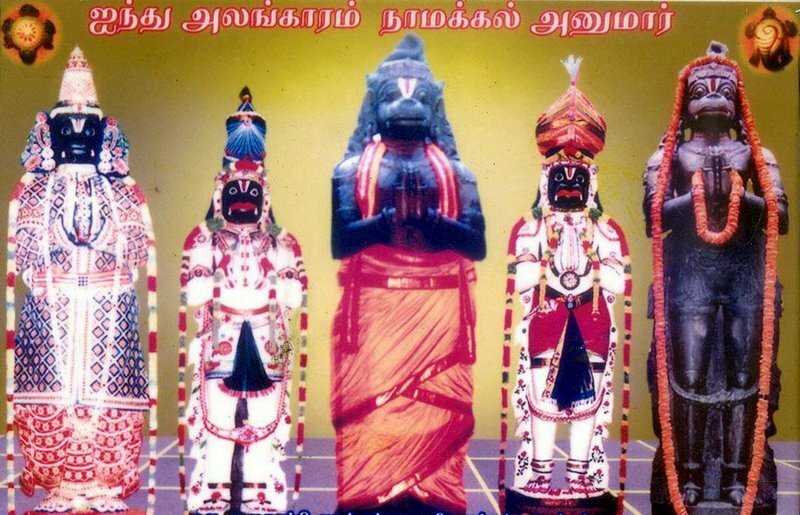 It is said that on the face of the stone, both Goddess Lakshmi and Lord Hanuman witnessed the Narasimha avatar, and that Saligraamam stone stands today as the Namagiri in Namakkal town. It is also interesting to note that in this temple, the Namagiri Thaayaar shrine faces Narasimha Swami – it is said that She faces Lord Vishnu, so that She can witness him in the Narasimha avatar. The architecture in these temples is beautiful – as I mentioned earlier, the Narasimhar shrine sits inside the Namagiri. The shrine has Lord Vishnu, as Narasimhar and Lord Shiva and Brahma on either side, and is called a Trimurthi sthalam. All the deities in the shrine have been chiseled into the cave wall. When the archagar in the shrine finishes with the archanai and deepaaraadhanai, he will point out to you, the fine intricacies in the stone work. The texture of the nails on Narasimha Swami’s fingers and a red hue of the rock on His palm (believed to be blood stains from the Hiranyasamhaaram) are some of the things that are pointed out. The Lord Narashima in the main deity of the cave temple atop the hill which is in the middle of this town Namakkal. The Lord Narashima is facing west sitting with his right leg placed to the ground, and His left leg is placed on the right thigh. The sharpness of the 'vajra naka' with which Lord had performed the Hiranya samhara is worth noting. Sri Jankan is standing on His left and Sri Sanadhan on to His right and telling the Lord about the "Lokashama" in His ears. On to his left Siva, and on to His right Brahma is seen pleading with the Lord to mellow down. This is very rare to see the Trimurthis in one place. This place is also known by the name 'Trimurthi Sthala'. Though Lord is seen in ugra form here He is Lord Lakshmi Narashima since it is the place where Sri Devi is also present after her penance. Since the Saleegramam had turned into a mountain open to sky Anjaneya is in Digambara temple with anjalihasta facing and worshiping Lord Lakshmi Narashima and the Saleegramam. The Anjaneya in this kshethra is eighteen feet tall and is having dharshan of the Lord Lakshmi Narashima who is about 250 feet away. The wonder of this dharshan is that the eye of Anjaneya is in straight line with the patha [lotus feet] of Lord Lakshmi Narashima. One could witness Anjaneya having the dharshan of Lord's Lotus feet from the Garudalwar sannathi even today. 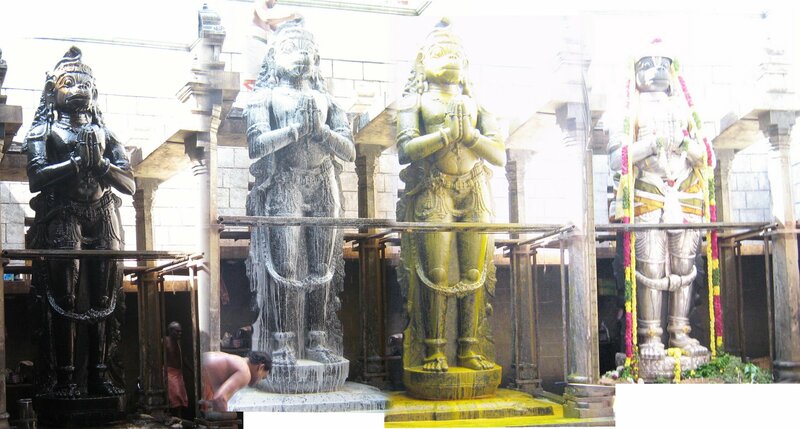 The imprint of the footsteps of Anjaneya Swami is seen in the Kamalalam tank steps. Namakkal Town is the Hq. of the Namakkal district, which is extensively covered with hilly ranges and rocks of the Kollimalai range of hills which runs along the east of Nammakkal.